The checkbox problem type is a core problem type that can be added to any course. At a minimum, checkbox problems include a question or prompt and several answer options. By adding hints, feedback, or both, you can give learners guidance and help when they work on a problem. In checkbox problems, learners select one or more options from a list of possible answers. To answer the problem correctly, a learner must select all of the options that are correct answers, and none of the options that are incorrect. The course team must set up each checkbox problem to have at least one correct answer. As a best practice, be sure that all of the answer choices are unambiguous, and avoid trick questions. Checkbox problems with ambiguity can be frustrating to learners, especially if the problems have a limited number of attempts. In the LMS, learners complete a checkbox problem by selecting the answer options that they believe are correct as well as leaving unselected the answer options that they believe are incorrect. An example of a completed checkbox problem follows. This problem was incorrectly answered because the learner selected only two of the three required answer options. This example also shows that the learner selected Show Answer to reveal the correct answer and an explanation. [ ] Non-immunized people will always fall sick. particular individual's choice to get immunized or not. [x] Trust in health care professionals and government officials is fragile. fewer benefits than they actually do. The OLX (open learning XML) markup for this example checkbox problem follows. 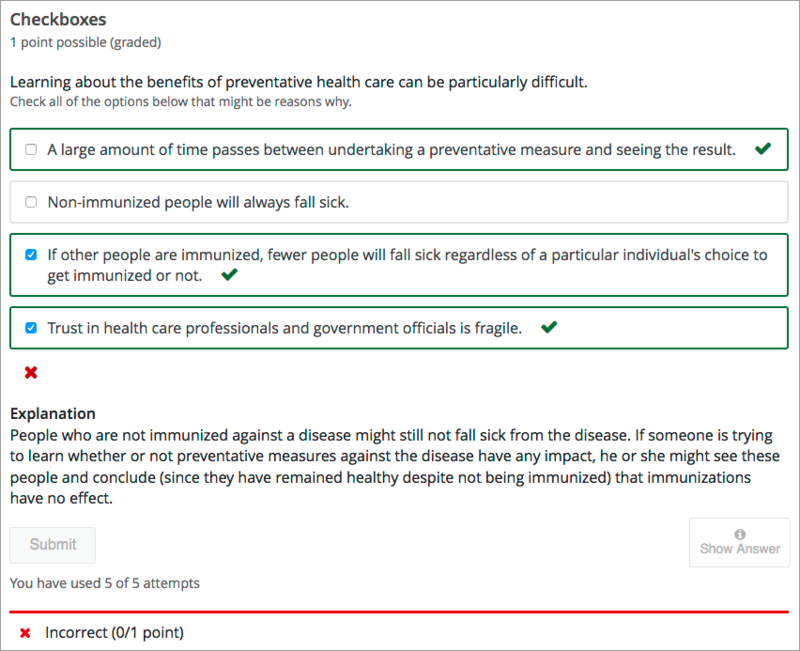 For the checkbox problems in your course, you can use edX Insights to review aggregated learner performance data and examine submitted answers. For more information, see Using edX Insights. You add checkbox problems in Studio by selecting the Problem component type and then using either the simple editor or the advanced editor to specify the prompt and the answer options. When you add a checkbox problem, you can choose one of these templates. You can use the advanced editor to identify the elements of a checkbox problem with OLX. For more information, see Checkbox Problem OLX Reference. For an overview of feedback in problems, see Adding Feedback and Hints to a Problem. For checkbox problems, you can add feedback for each of the answer options you provide in the problem. You can also identify different combinations of answer options that learners are likely to select, and add compound feedback for those combinations. You can add feedback to a checkbox problem using the simple editor or the advanced editor. In checkbox problems, you can provide feedback for each option that a learner can select, with distinct feedback depending on whether or not the learner selects that option. This means that there are several possible types of feedback. The learner selects a correct option. This type of feedback should indicate why the option is correct. The learner does not select a correct option. This type of feedback should indicate that the learner missed checking this option and why it is correct. The learner selects an incorrect option. 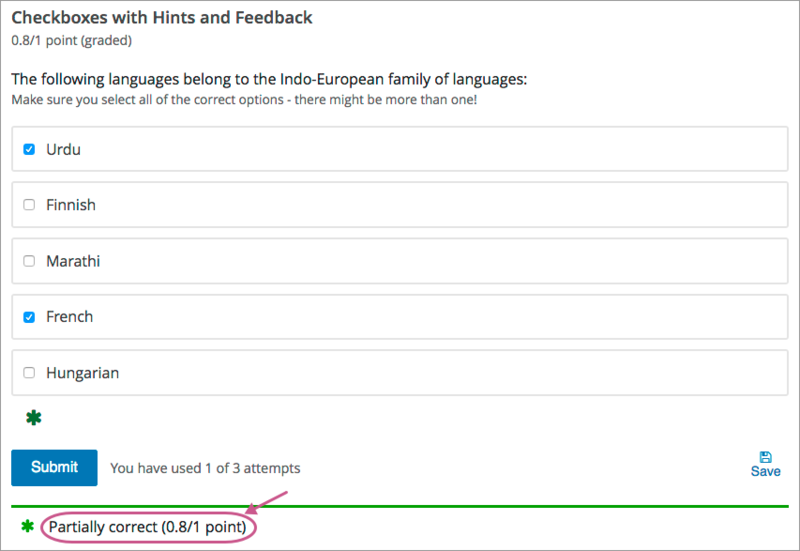 This type of feedback should indicate that the learner incorrectly checked this option and why it is incorrect. The learner does not select an incorrect option. This type of feedback should reinforce why the learner correctly left this option unselected. You can configure the checkbox problem to provide compound feedback. Compound feedback is feedback given for a specific combination of options. For example, if you have three possible option in the problem, you can define specific feedback for when a learner selects each combination of possible options. For problems with more than three options, providing specific feedback for each combination can become difficult. For such problems, you might choose to define compound feedback for more likely combinations of option or for combinations of option that reflect common learner misunderstandings. If you do not define feedback for a combination that a learner selects, the learner receives feedback for the individual selections. You can configure individual option or compound feedback in the simple editor. When you create a new checkbox problem, select the template Checkboxes with Hints and Feedback. This template has example formatted feedback that you can replace with your own text. In the simple editor, you configure individual option feedback with the following Markdown formatting. You can use S for selected and U for unselected. For example, the following problem has feedback for every answer option, whether learners select a given option or leave it unselected. In the simple editor, you configure compound feedback after the possible options, with the following syntax. For example, the following compound feedback is used when learners select options A, B, and D or A, B, C, and D.
fruits as they are all the fertilized ovaries of a plant and contain seeds. If you configure individual option feedback for every answer, and you also provide compound feedback, when learners select the exact combination of answer choices defined, they only see the compound feedback. In this example, learners who select apple (A), pumpkin (B), and tomato (D) see the message “An apple, pumpkin, and tomato are all fruits as they are all the fertilized ovaries of a plant and contain seeds.” They do not also see the individual feedback for selecting A, B, and D, and for leaving C unselected. You can configure individual option and compound feedback in the advanced editor. In the advanced editor, you configure individual option feedback with the following syntax. For example, the following problem has feedback for each option, selected or unselected. In the advanced editor, you define compound feedback by adding a <compoundhint> element within the <checkboxgroup> element. edible part of a plant in tuber form and is classified as a vegetable. You can add hints to a checkbox problem using the simple editor or the advanced editor. For an overview of hints in problems, see Adding Feedback and Hints to a Problem. You can configure a checkbox problem to award partial credit to learners who submit an answer that is partly correct. You must use the advanced editor to configure partial credit. In the following example, the learner selected two of the three correct choices, and did not select any incorrect choices. The learner therefore had four out of five correct answers. Because the course team set this problem up to award partial credit for every correct answer selected and every incorrect answer left unselected (known as every decision counts), the learner earned 80% of the points for this problem. You can use the following methods to award partial credit in a checkbox problem. You can configure a checkbox problem so that every selection a learner makes for the checkbox problem is evaluated and scored. This method is known as every decision counts (EDC). With EDC, if “n” is the number of possible options, learners earn 1/n of the total possible score for each correct option they select. Learners receive partial credit for every correct answer selected and every incorrect answer left unselected. For example, if there are four options, every option that a learner matches is worth 25% of the total score. A learner also gains 25% for each incorrect answer that a learner does NOT select. The following table shows how the different combinations of learner selections would score for one EDC problem whose answers are as follows. A, B, D 100% The learner matched each of the 3 correct answers for 75%, and also gained 25% for not selecting the incorrect answer. A, B 75% The learner matched 2 of the correct answers for 50%, and also gained 25% for not selecting the incorrect answer. A, B, C 50% The learner matched 2 of the correct answers for 50%, but selected the incorrect answer. A, C 25% The learner matched 1 of the correct answers for 25%, but selected the incorrect answer. To configure an EDC checkbox problem, you add the partial_credit="EDC" attribute to the <choiceresponse> element in the problem OLX. For example, the following OLX shows the checkbox problem template after it is updated to provide partial credit. You can configure a checkbox problem so that for every option that a learner gets wrong, either by not selecting a correct option or by selecting an incorrect option, half of the remaining points are deducted from the learner’s score. This method is known as scoring by halves. By design, partial credit by halves requires the number of answer options to be more than twice the number of incorrect answers. In addition, partial credit is not given for more than two wrong answers, regardless of the total number of answer options. In other words, two wrong answers is scored at 25% only if there are at least 5 answer options. Three or more wrong answers is always scored at 0%, regardless of the number of total answer options. Partial credit using the by halves method is calculated as follows. If a learner makes no errors, she receives full credit for the problem. If a learner makes one error, she receives 50% of the possible points, as long as there are three or more choices in the problem. If a learner makes one error and there are only two choices in the problem, no credit is given. If a learner makes two errors, she receives 25% of the possible points, as long as there are five or more choices in the problem. If a learner makes two errors and there are only three choices or four choices in the problem, no credit is given. If a learner makes three errors, she receives no credit for the problem, regardless of how many answer options there are. The following tables illustrate partial credit score using the halves method, for problems with an increasing number of total answer options. To configure a by halves checkbox problem, you add the partial_credit="halves" attribute to the <choiceresponse> element in the problem OLX. The following example shows a checkbox problem that provides partial credit by halves. For checkbox problems, the <problem> element can include this hierarchy of child elements. Required. Indicates that the problem is a checkbox problem. partial_credit Optional. Specifies the type of partial credit given. EDC or halves. Required. Indicates the beginning of the list of options. Required. Designates an answer option. Indicates a correct or incorrect answer. selected Required. true or false. Indicates if the feedback is given when the answer option is selected, or when it is not selected. Optional. Specifies feedback for a specific combination of answers. value (at least one required) Indicates the combination of selected answers that triggers this feedback. Answers are identified by uppercase letters, in ascending alphabetical order. You can use the <script> element to programmatically set attributes and options for your checkbox problems. You could use this feature to display different questions/answers depending on variable factors, like time of day, or randomly generated numbers. text0 = "$a + $b is divisible by 2"
text1 = "$a + $b is divisible by 3"
text2 = "$a + $b is divisible by 5"
text3 = "None of the above statements is true."